The Charlotte 49ers will begin their quest for their third consecutive Atlantic 10 tournament title on Wednesday when the sixth seeded 49ers (32-20) face No. 3 seed Xavier (33-18) at 3:30 p.m. at Fifth Third Field in Dayton, Ohio. Charlotte has won 30 or more games for school-record fifth fifth consecutive season and is seeking to become the first A-10 school to win the tournament title three straight seasons. 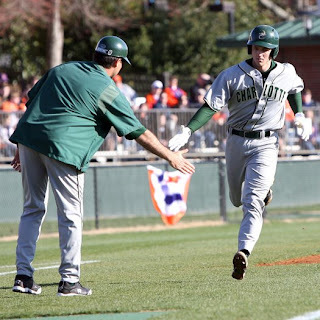 The 49ers are led by junior Rob Lyerly, the Most Outstanding Player of the 2008 Championship, and sophomore Ryan Rivers, who leads the conference with 18 home runs. Dayton earned the No. 1 seend, Rhode Island No. 2, Massachusetts the fourth seed and Fordham the fifth seed. Charlotte has won its last six tournament games on the way to the last pair of tournament titles and is 6-2 all-time in the championship since joining the A-10 in 2006. I don't care about anything other than Game 1. Yermel will have to do what he does best and beat Xavier. Game 2 will take care of itself. Tough draw. St. Bona just scored too much, Saturday.